The following case studies evaluate the performance of interlocking concrete pavers in varying climates/environmental conditions. These studies are grounded in research and scientific tests, which allow a user to understand the nuts and bolts of paver design in these respected areas. 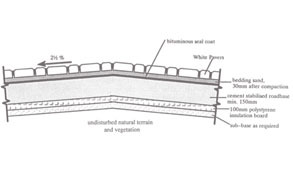 Cross-sections illustrate how one may go about construction and implementation. Cold Climates: Although interlocking concrete block pavements are used extensively in tropical and temperate regions, they have as yet been little used in cold climates. The problems posed by the construction and maintenance of pavements over permafrost and some of the special techniques evolved to overcome these problems are reviewed in this lesson. Marshy Environments: This lesson is focused on the implementation of interlocking pavers in marshy roads and high groundwater table terrain. 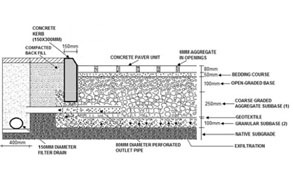 Permeable interlocking concrete pavers were used to combat intrusion of underground/saline water for case study. Different scientific tests and researches put together show the effectiveness and durability of the modified exfiltration system type of permeable pavement for high ground water table terrain.